If I had a nickel for every time I heard someone accuse a male eSports pro of actually being a woman, I’d have… no nickels. Unfortunately, as soon as a woman climbs the ranks of eSports, speculation starts about if she really has those skills. The latest bit of internet harassment has driven a female eSports pro to leave the industry. 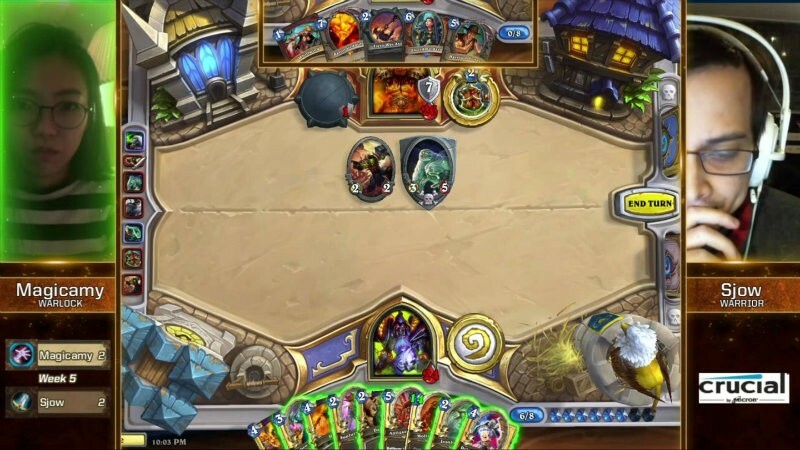 Last week, someone who was banned by Blizzard for Hearthstone win-trading took to Reddit to start a rumor. Eric Lee stated that Hyerim “MagicAmy” Lee was actually a persona created by a Korean girl who had a Canadian male play for her. He made this claim without any proof, but it sparked a massive Reddit debate getting a ton of upvotes and comments. In an effort to stop the witch hunt, the team MagicAmy plays for, TempoStorm, launched an internal investigation to see if anyone had ever played on MagicAmy’s behalf. It turns into this giant witch-hunt. So this girl, who is a pretty good Hearthstone player, and made a lot of content for the community, and everyone really liked her, now her career is being scrutinized by Blizzard, by her team, by the entire community–everyone is convinced she’s a man. So what do we do? We spend three days doing a full f**king investigation, talking to three dozen people, cross-referencing times when sh** happens, when people say they met her, cross-referencing flight records, we’re getting screenshots of Skype conversations from everybody, and basically just investigating so deep into this girl’s life, just because dip-sh**s on Reddit decide to start a witch-hunt. You can watch the entire expletive-laden video over here. Not interested in harassment or allegations, MagicAmy decided to retire as a professional Hearthstone player. This is a major blow to eSports and women in gaming. There will always be cheaters online, as well as false accusations. However, the level of vitriol seen against this female professional is ridiculous. If any eSports pro is discovered to be a fake, it would be a major setback for eSports. However, for people to feel compelled to hurl accusations without any proof simply because a female player is perceived as being too good? This is ridiculous. While it is just one provenly unethical man on a mission, the fact is that over 2000 people upvoted it on Reddit. That means that over 2k people decided that this vicious and completely untrue rumor was worthy of more attention. While we tend to shrug and say that sexist gamers are a small minority, it’s hard to keep doing that when the numbers keep showing that it isn’t quite as tiny a minority as we may hope. Of course, I wish that MagicAmy had stayed on once her identity was proven. However, I’m sure she simply didn’t see the point in tolerating the harassment and invasion. While we like to think that professional athletes (in any sport) are role models, they are also human – it may be great for girls to be able to look up to her in eSports, but they also shouldn’t be taught that harassment (which likely would have continued) is okay and to be tolerated.